***Review posted on The Eater of Books! blog***Faces of the Dead by Suzanne WeynPublisher: ScholasticPublication Date: August 26, 2014Rating: 3 starsSource: ARC sent by the publisherSummary (from Goodreads):When Marie-Therese, daughter of Marie Antoinette, slips into the streets of Paris at the height of the French Revolution, she finds a world much darker than what she's ever known.When Marie-Thérèse Charlotte of France learns of the powerful rebellion sweeping her country, the sheltered princess is determined to see the revolution for herself. Switching places with a chambermaid, the princess sneaks out of the safety of the royal palace and into the heart of a city in strife.Soon the princess is brushing shoulders with revolutionaries and activists. One boy in particular, Henri, befriends her and has her questioning the only life she's known. When the princess returns to the palace one night to find an angry mob storming its walls, she's forced into hiding in Paris. Henri brings her to the workshop of one Mademoiselle Grosholtz, whose wax figures seem to bring the famous back from the dead, and who looks at Marie-Thérèse as if she can see all of her secrets. There, the princess quickly discovers there's much more to the outside world - and to the mysterious woman's wax figures - than meets the eye.What I Liked:Oh, the French Revolution. I LOVE historical fiction, and I especially love the time period of the French Revolution! There is a neat "Bad Romance" parody describing the Revolution, if you're interested. My tenth grade World History teacher always shared it with her World History classes. It's a really good one!Marie-Thérèse is the French princess of this time. She lives in complete contentment with her father, mother, little brother, and friend Ernestine. She and Ernestine have eerily similar physical features... which always them to swap places. Ernestine becomes the princess for the day, and Marie-Thérèse runs around the palace, enjoying freedom she wouldn't as a princess. One day, Marie-Thérèse decides to leave the palace. Soon, she sees what France REALLY is - a poor country, its citizens starving, destitute, and calling for revolution. Marie-Thérèse stays with Henri, a kind boy who takes pity on her, and Madame Grosholtz, a woman who models faces and sculptures of wax - among other things. The country's situation deteriorates, and the royal family is captured. Marie-Thérèse doesn't want to flee when her family and Ernestine will be killed...This book is super short, but A LOT of time goes by. It takes us from Marie-Thérèse's childhood all the way through the French Revolution, I believe. Because it's pretty strictly historical fiction, in which it's historically based on a time in France's history, we know what's going to happen to France, to the royal family, etc. But I enjoyed the ride. I love the vividness of the scenes in this book. Weyn has really brought to life the realness of what was the French Revolution, the starvation, the poverty, the guillotine. The luster of the palace and Versailles and the royalty was easy to imagine. The writing style of this book is pretty awesome, and the imagery is even better. I was impressed!Even though I'm very familiar with the French Revolution, I was still hooked on the story, and couldn't wait to see what happened next. Especially with the paranormal aspect - I kept wanting to know how that would factor into the book (see below). Knowing the outcome didn't ruin the journey for me!There is a touch of romance - it's not very subtle, because you know it's Henri and Marie-Thérèse, as soon as Henri is introduced. But it's not insta-love, because they don't "get together" until late in the novel. Nevertheless, the romance isn't overpowering or dominant, which was nice.Overall, I liked this book. I'm a huge fan of historical fiction, so I couldn't say no, when I saw this one. What I Did Not Like:This book is getting three stars (versus four or five) for several reasons. For one, I was heavily disappointed by the promised paranormal aspect of the book. Oh, it's there. We know Madame Grosholtz and Rose is up to something. But it was disappointing, once we get to know what it was. I was like, that's it? That's all? And its influence of the story... wasn't all that awesome. I was expecting so much more, in terms of the faces of the dead, the death masks, the "magic", etc. The author just didn't deliver!That being said, I found the ending to be rushed and hasty. The ending is dependent on the paranormal aspect, as it changes things for Marie-Thérèse. I kind of rolled my eyes at the end, because OF COURSE xyz thing would happen (no spoilers here). And OF COURSE this one thing with Henri would happen too, at the very end. I spoil things, but while I was happy with the ending, I wasn't necessarily satisfied. Everything ended... too perfectly and merrily. In the actual French Revolution, that wasn't the case. But this is fiction, of course.Would I Recommend It:I would recommend you read this book if you already have it, or were already interested in it. If you've never heard of it, or the author, then it's totally fine to keep going on with your life and pretend you never read this review or saw this book. Rating:3 stars. I'm happy that I had the chances to read this book! Hopefully future novels by this author will be just as impressive, in terms of the imagery, and maybe fleshed out, in terms of the plot and things. Received a copy of this via Netgalley in exchange for a review at www.bookishserendipity.com .I’ve always been intrigued by the French revolution, so when I had the chance to read this novel, I was thrilled! Marie- Therese is the daughter of Marie Antionette who, after her home is mobbed and the rest of her family is captured, is sent into hiding…on the streets of Paris, the very city that wants her dead. The premise was interesting but unfortunately, the execution wasn’t as great as I had hoped.When Marie-Therese is forced to flee from her family, she runs into a boy named Henri. She immediately decides to trust him, even though he is working for the rebels that are trying to kill her family. Is anyone else seeing the problem? Instead of running FAR away in the opposite direction, she stays with him and Mademoiselle Grosholtz. I just couldn’t really relate to Marie-Therese and she made a lot of selfish, immature decisions that left me thinking…WHAT?jessicaAnd…insta-love. Marie-Therese has known Henri for merely a few days, and she is already thinking about what their life together would be like. Why? I didn’t understand the attraction, and I kind of wanted to skip over the scenes with Henri.The magical elements in this story aren’t introduced until more than halfway through the book, but I didn’t think that magic was necessary at all. This book is *technically* historical fantasy, but it would have been much better as just a historical fiction novel. If anything, it would have made the ending a lot less…creepy.One of the things I did like, though, was the detail and world-building in this novel. Suzanne Weyn really captured the nitty-gritty (emphasis on the gritty part!) details of the French revolution. The difference between the poverty of the streets, and the luxury of Versailles was well described. The imagery was a great part of this book.Overall, this book really wasn’t for me, but that doesn’t mean that you wouldn’t enjoy it! If you’re willing to give this a try, or if you’ve read it, do let me know your thoughts! Faces Of The Dead is about a girl named Marie-Th'ere'se-Charlotte. She is a princess and has always wanted to explore the world of Paris. She switches identities with her friend so that she can explore Paris. She finally got to Paris and the streets are dark and dangerous. She overheard a person saying that they have a plan to attack the king. Marie-Th'ere'se-Charlotte has to go though some tough challenges to save her family. I liked the book but there were some parts that did not make any sense. My favorite part about the book was when Marie-Th'ere'se-Charlotte found her mom. I recommend this book to people who like action stories. Overall Marie-Th'ere'se-Charlotte has to go though difficult choices, tears and deaths. When I picked this up at my library, I thought that it sounded interesting. I was a bit wary because of the title. (When I was reading, the title made sense and it was fine. )The reason I give it a 1 star, is because it had voodoo, spirits, and bringing people back from the dead. As a Christian I felt like you should not read anything with voodoo and spirits. I was disappointed in the book. If it didn't have the voodoo and things, I would have given it a 4 star. One would think that in writing a novel--however loosely based on historical fact--a person would perform research. Even perfunctory research would be appreciated. Author's notes should address where liberties were taken with the recorded history.Well done (sounds like a steak!) historical fiction illuminates the time period and the time period enriches the story being told. An excellent example of this is Cat Winters' upcoming The Cure for Dreaming, which I reviewed here. Another great YA HF is A Plague-Struck Year by Makiia Lucier. You shouldn't just set your story during, say, the Bolshevik Revolution unless that setting will add something to the story you have to tell.That's my own opinion, anyway. It's not some sort of writing rule, but it's a rule I set for myself, as a reader, when I select books.I know, too, that sometimes I'm just asking for it when I request a galley. I'm pretty sure that 95% of the time, it won't be worth my while (however, I try to read enough of something to get a feel for whether the teens my library serves would like it. If it has appeal, I'll still buy it. However, if something is just plain, flat-out poorly written or researched, I don't want to misinform my teens.I've already admitted to having difficulty keeping certain authors straight in my mind--Scott Snyder and Scott Sigler are the two that I conflate most often (and I really shouldn't!) --but another strange mind-pairing is Diane Zahler and Suzanne Weyn. Honestly, I don't know why I get them confused. I adore Diane Zahler's princess fairy tale retellings for younger readers (they're so sweeeeeet and fluffy like marshmallows! ), so when I saw an ARC available for a book by Suzanne Weyn, my brain got confused and said, "Yay, more princesses!" Oops. Well, technically there is a princess in Faces of the Dead. One Marie-Therese, daughter of Marie-Antoinette and Louis XVI. It's French Revolution time.Then I remembered that Weyn recently released a book called Doctor Frankenstein's Daughters, which was not well-reviewed (well, actually, the reviews were hilarious. But scathing). As I clicked through into Faces of the Dead, I was ill-prepared for what awaited.When it comes to any sort of revolution, there are obviously two or more sides to the story. Some historians will take the part of the overthrown, others the part of the revolutionaries. I feel mildly qualified to offer some comment on the choice of setting here, since I have a B.A. in French and did a lot of French history and Western Civ classes in college. A revolution isn't something that happens overnight--the whole cult-of-the-Sun-King thing with Louis XIV, not to mention his extravagant spending and building and wars, certainly created conditions that were ripe for revolt (yum!). Plus, Louis XVI had no ruling experience, and neither did Marie-Antoinette. Yep, they did idiotic things, but it's hard to be a great king/queen when your parents did little to train you. They didn't exactly have a University of Phoenix night course back then called Monarchy 101. The people had every right to be ticked off, too. No food, high taxes, aloof and silly rulers who didn't listen, a religious environment more interested in making money than helping the poor--yep, I'd be mad too.So, here we are. Suzanne Weyn is evidently firmly in the pro-Marie-Antoinette-and-Louis-XVI camp, but her writing doesn't acknowledge that what they were doing (or not doing) was also very wrong for the people and the country. They weren't innocent victims. They made very, very poor decisions, or they neglected to make decisions entirely. I don't want this to turn into an essay on the behavior of the Bourbons during the outbreak of the Revolution, because I'm not getting any credit/money for that, and I think I've already written enough of those during my academic career.Let's cut to a fun, totally time-appropriate quote, shall we?" 'We are one,' I say. 'That's why we look alike. We're one soul with two bodies.' "That's the Princess Marie-Therèse to her chambermaid, Ernestine. Evidently, they are omigoshtwinsies! and switch places a lot at court so that Ernestine can hang with the fancy peeps and Marie-Therèse can scamper around Paris. M-T (abbreviated because I am lazy. A hyphen and an accent grave is a bit much to ask of me tonight as my head pounds with histamine reactions to pollen) says dopey things like the totally deep one above, and paints herself as a sort of pre-Revolution beneficent monarch who completely loves and adores the common people of France. In the first few pages, M-T reminisces about her first memory, which is when she and the royal family (or would it be Royal Family?) meet the plebes in the courtyard at Versailles. Pretty Pretty Princess remarks, "I love the smell and sounds of the crowd. All kinds of people are here. Some are very well dressed. Others are ragged and without coats or cloaks on this frigid day. But we are all happy. Excited."Um. First of all, I know that the Court at Versailles barely had rudimentary hygiene concepts (people routinely just peed and pooped in the corners because ... they're there), and so M-T probably didn't have a great concept of what "smelling nice" was, but I honestly think that someone brought up in a palace would definitely notice the smell of the unwashed masses, who didn't have time to clean themselves, because they had to work ridiculously hard for no money and no food. Horse poop, cow poop, human poop--they would have had it all. Also the body odor was, I'm sure, astounding. You can get a little whuff of it even today--just ride the Métro on a sweltering July day. So "I love the smell of the crowd" is really piling it on thickly. Secondly, Weyn totally undercuts her whole mission to make M-T likeable by having her remark on the lack of clothing that most people have, but then cheerily state that they're all happy anyway just because they get to see the royal family. Gee whiz, if I were a French peasant of, oh, I don't know, 1780, I'd definitely rather have a pair of warm boots than the opportunity to see the King. M-T, being such a wee little adorable child, begs her parents to set up a feast for the masses, but M-A and Louis XVI say there's not enough food. M-T: " 'Please, Mama,' I beg, 'these people are our subjects, aren't they? Isn't it our duty to feed them?' " [image error]There really are no words to express the utter inanity of this character. She natters on like this constantly, talking about how she "envies the freedom" of peasant children because they can run around and junk. Yes, and then they will die of cholera. Yay!A few chapters of useless exposition later (mostly describing the aforementioned body-double Ernestine and their place-switching), M-T sets off to see Paris. She's dropped off by someone who's evidently like the Versailles taxi-driver at ... the Place de la Concorde. The what? Where? I'm sorry, Place de la Concorde did not exist in 1789. Well, I mean, the place existed, but it was called Place Louis XV, and there was no fancy Egyptian obelisk there (notably because Napoléon hadn't invaded Egypt yet!). Place de la Concorde became Place de la Révolution during the (you guessed it!) Revolution/Reign of Terror, and was the main site of executions by guillotine. M-T's father was beheaded there. After various other revolutions and restorations, everyone agreed to stick with Place de la Concorde, which commemorated the peace (or "peace") brought about by the Directory in the late 1790s.You don't have to be a French major/librarian/major nerd like me to catch that. I mean, this is one of the things that you can Google. It is on Wikipedia (which I normally don't recommend as source material, but it's actually generally quite accurate when it comes to well-known places and events). When I read that line about getting dropped off at the Place de la Concorde, I abandoned all hope. A bit later on, she runs into a Hot Guy named Henri, who acts as her (very convenient) tour guide to Paris, and educates the Princess on Revolution and Other Important Social Stuff. There's loads of sappy dialogue like, " 'Ernestine, I can tell you've got a kind, good heart. You think the best of everyone, even the selfish royals. I'm glad you bashed into me today.' 'You are?' I ask. 'We'll be the best of friends, always.' 'I hope so, Henri.' " Whaaa ... who talks like that? Well, five year olds: "best fwends fowevah!" Evidently, Henri is the Mandatory Love Interest and Hot Guy, so they have to, you know, be friends and stuff. I think the rest of the book deals with M-T trying to save her family and herself and I'm sure she probably escapes by switching places with her maid (the foreshadowing, it is so heavy, I'm being crushed like Giles Corey over here). Other reviewers mentioned something about magic/voodoo ... yeah. The title refers to an artist/sculptor who makes death masks (she may also be the one involved in the alleged voodoo, but please don't quote me on that). Whoop-de-do. This is just a whole mess of Not Good. No fact-checking, no believable characters, and plot contrivances up the yazoo. Don't insult the intelligence of your readers when you write historical fiction. Just because the word "fiction" is in there doesn't mean you can completely ignore the "historical" part. I received an ARC of this title from Netgalley. As an adult reader it seems like it is missing chunks of story and it does not tie things together in a satisfactory way. That being said, I enjoyed the historical aspect of the story and I can appreciate the main characters struggles. She seems to get away with so many things and sometimes just seems swept up in events while not really trying to guide herself through them. I wish the story did not have the mystical elements to it. I would have enjoyed it more without them. I think the things that bother me about it will nit be a problem for the kids. I already have a few in mind to recommend it to. I learned about the French Revolution briefly in school and loved being able to see it from a different point of view. I was a little surprised from their being voodoo involved in the story but it was a great ending to it all the same. It was also fun to see all these real characters in history come together. Very entertaining book that was very educational at the same time! I'm a history buff and I learned quite a bit about this revolution that I didn't know. Marie-Thérèse-Charlotte is the daughter of Marie-Antoinette and King Louis the Sixteenth of France and lives in Versailles. Even though there is relative calm in her family circle, France itself is upset with the royal family. The people are starving and believe that the royal family doesn’t care for those that pay the taxes. Marie-Thérèse wants to go out into the city and see what being outside the palace is like. But she can’t do that on her own. Luckily she looks almost like a twin to Ernestine, a servant girl who lives at the palace. Marie-Thérèse and Ernestine switch outfits and Ernestine pretends to be the princess while Marie goes out to the city to see life for herself. Only the city is not what she expects it to be. People are not just angry, they want to do harm to Marie-Thérèse’s family and any other royals who stand in their way. If it wasn’t for the fact that Marie-Thérèse was dressed like a servant and that she met a nice boy named Henri she would have been in real trouble. Soon Marie-Thérèse and Henri are exploring all over Paris while Ernestine is playing the role of princess more and more. Understandably Marie-Thérèse and Henri soon fall in love while Ernestine falls for Marie-Thérèse’s betrothed. Then the French Revolution comes to a roar and Marie-Thérèse’s family order her and Ernestine to trade places to keep at least one member of the royal family safe.This book is basically 200 or so pages of drama with a French revolution background. Readers can guess from the first moment that Marie-Thérèse and Ernestine trade places (and thanks to who Marie-Thérèse is and when she lived) just where Marie-Thérèse would be when watching her family meets the guillotine. Of course her family is not what everyone says they are. Of course the revolution is one horrid bit after another. But the black magic? Really? Marie-Thérèse and her re-incarnated mother get to live happily ever after at the end (with loving Henri nearby of course)? And Ernestine escapes the horrid prisons and gets to marry her true love Marie-Thérèse’s fiancé? Those readers who thrive on drama with a historical setting will enjoy this book. But it was not written well enough to really tempt me. Faces of the Dead was absolutely brilliant. Part of me was screaming out of joy just due to the time period it takes place in, I am really big on history and I love to read about the French Revolution. It was such a volatile time, but I feel like there is so much that can be learned from it. And just the ideas people had, and ways people use to act back then is really interesting. With that said, I feel like Suzanne did an incredible job researching the era and really making the people she is trying to portray in this work of fiction, come alive again. I loved that she mentioned in the notes at the end, that she didn’t want this book to feel like a textbook. And I think that can be difficult sometimes when you are trying to stay as true to the actual events as possible. She definitely handled everything well, there are some noticeable changes, which she also notes at the end, but other than that, if you are familiar with the revolution, even just basic knowledge, I think that you will really enjoy Suzanne’s take on it. It’s hard for me to deny that I was instantly drawn to this book. There is nothing that would have kept me from reading it. I will admit that I was ready to be extremely critical of certain things, as when it comes to historical fiction, I really do like to see some of the information in the books backed up by actual facts. But as I mentioned above, it really seems like Suzanne really went and did a massive amount of research to be able to delicately balance the line between fact and fiction and really create an incredibly enjoyable young adult book that follows the struggles that Marie Therese went through during the revolution. If you enjoy historical fiction, this is definitely a book you will want to pick up. It was written very well, and as I mentioned several times, you can definitely see the amount of care that Suzanne put into researching the revolution, and you can see how hard she worked to put in a great balance of fact/fiction to create such a wonderful story. I highly recommend that you try to read this book, whenever you get the opportunity too. While the French Revolution is brewing outside her castle walls, 17-year-old Marie-Therese-Charlotte longs to experience life beyond her sheltered existence regimented by her mother, Queen Marie Antoinette, and her father, King Louis the 16th. So one day she trades places with her look-alike chamber maid, Ernestine, and truly sees for the first time how difficult life is for those in her country. One of those struggling is teen Henri, who takes her under his wing, and shows her around Paris. As Marie-Therese’s visits to the streets of Paris increase, so do the tensions between the revolutionaries and the aristocrats. One evening upon her return to the castle, Marie-Therese finds a threatening mob and her family encourages her to return to Henri and continue hiding out until things are calm again for the royal family; they think she’ll be safer hidden away while Ernestine assumes her position inside the castle.Henri takes her to the workshop of Mademoiselle Grosholtz, who is known for her wax figures of famous people. Soon Henri and Marie-Therese are working alongside Mademoiselle Grosholtz as she collects the heads of those recently executed by guillotine and is forced to make wax molds of their heads to go on display as a warning to others.Marie-Therese is torn between the growing love she feels for Henri, along with increased sympathy for those struggling to eat, against the love she feels toward her family, even though she is learning her parents have not always made the best choices for all the citizens of France. With no easy choices, time is running out for the peasant-disguised princess to make the ultimate decision for her future. Unfortunately, a weird plotline (view spoiler)[ involving resurrecting those killed using voodoo(hide spoiler)] caused me to lose interest in the story, but teens might enjoy the unexpected twist and the inside of look of life inside the French Revolution. How cool would it be to have a friend who looks so much like you she could be your twin? In Suzanne Weyn's Faces of the Dead, Marie-Therese has that opportunity. She is the princess of France, the daughter of Marie Antoinette, and her chambermaid, Ernestine looks so much like Marie-Therese that many who work in the palace confuse them constantly.Marie-Therese uses the physical similarities between the two to take advantage of the freedom of running around the streets of Paris while Ernestine steps in as princess and is given the chance to be royal, one that servants never even dreamed of. While roaming around Paris at the beginning of the French Revolution, Marie-Therese runs into Henri, a teenage boy who becomes Marie-Therese's closest companion.Ernestine warns Marie-Therese that she doesn't want to see the real Paris and what's happening in the streets at the beginning of the revolution, and it doesn't take long for Marie-Therese to realize what it's like for those less fortunate. When Marie-Therese's family is threatened, she must decide what to do and whom to trust, all the while, Henri is changing the way Marie-Therese thinks about politics and her own beliefs.I was really excited about this book because of the promised paranormal aspect, especially as we near October. However, the supernatural aspects never really came to fruition and neither did the hinted romance between Marie-Therese and Henri.I don't gravitate toward historical fiction, but I thought the twist of introducing paranormal activity would be interesting and new. Without the full aspects of what a typical YA book contains, this book falls short in the end of what I expected.Interesting paranormal concept that never really happens and leaves the reader wondering what could have been.Check out my blog at reviewscomingatya.blogspot.com. 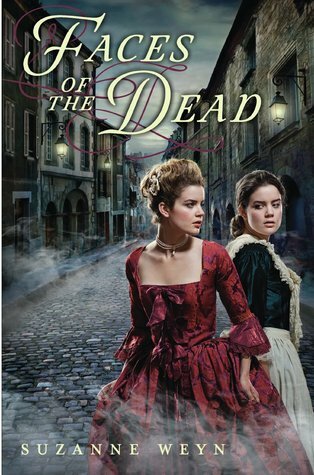 “Faces of the Dead” by Suzanne Weyn is a historical fiction that takes place during the French Revolution. The main character is princess Marie-Therese-Charlotte and some other characters include her look alike chambermaid, Ernestine, and Henri; a boy who lives in poverty on the streets of Paris. The novel is in the princess’s point of view and it’s written in almost a diary format. As Marie-Therese grows older, she and her chambermaid/playmate, Ernestine, realize that they are almost identical and begin to swap places with each other. When Marie-Therese hears talk of a revolution she trades places with Ernestine once again to see the streets of Paris for herself; not realizing that they are crowded with poverty and people who want her and her family dead. She meets a boy her age named Henri and tells him that her name is Ernestine. They quickly become friends. As trouble rises with the rebels, the princess is forced to live on the streets under a false name while her friend acts as the princess of France. She lives with Henri as the revolution becomes more serious and dangerous to her and her family.This book was a great way to look into the past through the undercover princess. It took a few chapters for the book to get interesting though and some parts were confusing to read. This book is not apart of a series, but if it was I would definitely be curious about what happens in the sequel. Almost all the characters named in the book (excluding Henri) were actual people. Most of the events were real too, which made the book seem more interesting after I learned that. I would recommend the book to a classmate or friends. Only if they were interested in the genre and subject though. Overall, it was a good book. **Contains spoilers***Faces of the Dead by Suzanne Weyn is a historical fantasy novel for teens set during the French Reign of Terror. Marie-Therese-Charlotte, the eldest child of Marie Antoinette and Louis the XVI, longs to see ‘the real France’ and convinces her best friend Ernestine, the daughter of a chambermaid, to switch places with her so that she may go into Paris and see the wonder and squalor herself. Marie-Therese befriends a young man named Henri who calls himself a ‘citizen’ and supporter of the revolution. When things get ugly for the royal family, the king and queen ask Ernestine to remain in disguise with them as the princess and send Marie-Therese into hiding at the wax exhibit run by the Mademoiselle Grosholtz, the future Madame Tussaud. During her time there, Marie-Therese assists in gathering the decapitated heads of famous royalists so that Grosholtz can create their death masks for the revolutionists. While a story about a naïve princess getting a reality check might have been a decent story, this one dives into the realm of complete malarkey. Marie-Therese and Henri discover that Mademoiselle Grosholtz and her compatriot Rose are attempting to bring the guillotined back from the dead. It should also be mentioned that Rose is a voodoo priestess from Martinique who eventually becomes Josephine, Empress of France. Even more bogus is the moment when the reader discovers that Mademoiselle and Rose have actually succeeded in providing a body for the spirit of Marie Antoinette and that Marie-Therese lives happily ever after with her and her beau Henri on a farm in Charenton. Yes, you read that right. Marie-Thérèse Charlotte of France likes to switch places with her maid, Ernestine, who looks a bit like her. She doesn't have to perform some dreary royal duties, and she can also go outside the palace and find out what is going on in her country. Of course, with her mother being Marie Antoinette, nothing good is going on. Marie-Thérèse meets the charming young Henri, who has moved to town after the farm on which he grew up was lost, and he is not shy about sharing the popular views of the royal family with "Ernestine". When she is out with Henri one day, she returns to find out that the palace has been taken over, and her family captured. She looks on at them from the outside, but doesn't want to risk being caught as well, because she has fallen in love with Henri. When the revolution progresses, she knows that members of her family will be killed, but starts to realize also that the life of the ordinary person at the time is rather unpleasant. Strengths: The notes at the back state that Marie-Thérèse was the only member of the family to survive, although accounts are unclear as to how she managed this. There was a maid whom she resembled, and there is a likelihood that the two switched places. The details of the time and the account of the revolution are interesting, and the book is not terribly long. Weaknesses:There is a weird paranormal twist at the end with Napoleon's Josephine that didn't make much sense and which I could have done without. Is this fantasy? Probably. What I really think: For readers of Ann Rinaldi's Nine Days a Queen and of Carolyn Meyer's Young Royals books, this will be a hit. I was interested in this book for two reasons: 1) because ever since reading The Scarlet Pimpernel I've been more curious about the French revolution and 2) because wax figures simultaneously freak me out and intrigue me.However, not after I began, I could easily tell that this book was not really one for me. The beginning wasn't bad- although perhaps over simplified and a bit unrealistic historically- but as the Reign of Terror went into full swing it began to get a little graphic for me. Given the subject matter, I was expecting a bit of gore, but not to this extent in what is considered a middle-grade book. Also, it started to hint at voodoo and magic and not only do I take issue with that from a moral standpoint, but it also didn't fit a story I thought was at least going to try to be historically accurate. Then looking at some other reviews, I quickly decided that this book really wasn't worth any more of my time, so it's one of the few only books I've gotten for review that I haven't finished.I really hate not finishing books, but I have a growing TBR pile- all for review -and I just really couldn't get into this one. The writing style itself was pleasurable, but the content didn't match. The plot seemed almost sloppy in comparison. Anyway, I'm not going to totally rip it up- after all, technically I didn't finish and it could have gotten better. But quite frankly, I didn't care enough to find out.I received this book from netgalley.com in exchange for my honest review. Marie-Therese-Charlotte, the daughter of Marie Antoinette, is a teenager when the French Revolution changes a great deal in her country. Since she and her chambermaid look so much alike, she often enjoys wandering among the common folks and going unnoticed while Ernestine fills in for her and does her royal duties. Once it's clear that there will be escape for the royals and the Revolution increases in intensity, Ernestine takes her place in prison while the princess works with those who are fashioning waxed faces of the men and women who are being executed every day. She finds romance with the loyal Henri and comes upon a quiet plan on the part of some of her benefactors to bring back to life some of the royals who have been killed. Although that part of the plot struck me as highly unlikely and rather disturbing--for instance, to what ends would these individuals be brought back to life?--I appreciated the author's gripping details about this bloody part of history. Many teen readers will learn a great deal about the reasons behind the French Revolution and find themselves sympathizing with both sides, just as Marie-Therese does. The naïve and somewhat careless attitudes of those in power comes through loudly and clearly here. Still, as she does with all of her books, the author provides readers with a unique perspective on an important series of events. I just finished reading faces of the dead by Suzanne Weyn. It is a historical fiction book that takes place during the French Revolution. This book shows how the main character, Marie-Therese, has to grow up fast because of the French rebellion. Marie-Therese is a princess who has never been out of the Palace but has always been curious about the village. This book tells about her experience when her parents force her to go live in the village. Other characters in the book are Henri, Rose and Mademoiselle Grosholtz who helped provide her with a place to stay and a job. Marie-Therese struggles against supporting her parents or the revolution.I found the beginning of the book to be boring. The book gets better when Henri starts showing Marie-Therese around the town and she begins to see that the revolution is starting. What was interesting about the book was Rose’s and Mademoiselle Grosholtz practice of voodoo. Two things that surprised me about the book was that Henri knew Marie-Therese was a princess and the cruelty of the villagers. I would not read another historical fiction book because I had to get all the way to the middle of the book before it got interesting. Also, the language in the book made it hard to follow. It was hard to understand why the parents did what they did so I couldn’t relate to it. Marie-Therese has lived a pampered life. As the daughter of Marie Antoinette, she never wanted for anything and believes that everyone lives a comfortable life, even if it isn’t like hers. After she slips into the streets of Paris during the French Revolution, she learns that the poor are tired of having nothing and that they will not be satisfied until all of those who are rich and noble are put before the Guillotine. During her trips outside the palace walls, she builds relationships with activists and revolutionaries. She doesn’t agree with their methods, yet she is pulled toward their cause.Faces of the Dead is an historical fiction story that throws many “what-ifs” at the reader. Weyn takes many facts about the French Revolution and tweaks a few other facts to create a story that is plausible and believable. For readers who know they enjoy this historically rich time period, this will be a pleasure to read. Yet if a reader is unfamiliar with this time period or is not a fan of historical fiction, this book would not be a strong recommendation. Although there are better historical fiction novels about the French Revolution, this book was good and not a waste of my time. Honest review given in exchange for copy of the book by Netgalley:This book should definitely be taken as historical science fiction. Once you read the author's notes at the end, you get a better sense if what has changed historically. Overall, Faces of the Dead was okay. It eased my need for historical fiction, but didn't blow me away. I was really disappointed because I had such high expectations going into the novel. I was so excited to finally see something about the French Revolution from Marie-Therese Charlotte's point of view. She is the lone survivor. Everything seems to revolve around Marie Antoinette. Finally, we get someone new. However, the entire story could have existed without the supernatural elements. That's just me. I think they took away from the story and put things into a totally different category. It was like watching a show jump the shark. I did keep reading because I cared and wanted to know about the characters' fates. The voodoo stuff was just shtick. I actually didn't know what this book was about when I picked it up, so I was really excited to find out it was about Marie Antoinette's daughter. I was lucky enough to visit the Palace of Versailles last month, so a story about the French Revolution was perfect timing for me. I enjoyed this book a lot, but that is possibly just because I was having so much fun picturing Versailles in my head. If I had read this at a different time I might not have liked it so much, but it definitely worked for me right now.By the way, I assumed throughout the entire book that Ernestine was made up, but according to the author's note at the end she was real, AND she really did look a lot like the princess. Now I'm intrigued, and want to find out more about her! Received from:Scholastic Received Via: NetGalley.com THE REVIEWWhy this book?I always been interested in the French RevolutionWhat I thoughtI always been interested in Marie Antoinette, so seeing this was supposed to be about her daughter I didn't hesitate to request it. The premise was interesting and the story moved on rather quickly but at parts it was lacking. Like the romance I just didn't feel the connection. I also couldn't connect with with the characters and all the voodoo stuff I thought was ridiculous. I thought I was reading historical fiction not supernatural. I liked this book but didn't love it, it held my attention till the end nonetheless.